Picked up this X-9 daily last week. Stamped with Chester Kozlaks name on the back. I wonder how many Mel Graff X-9 originals he had? Maybe he assisted Graff this period and kept some of the originals? Just a thought. 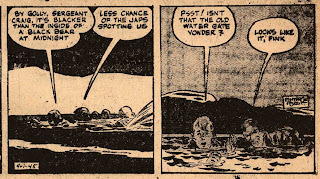 Anyone seen more originals from this 1942 adventure? So... here's post 313 (!) 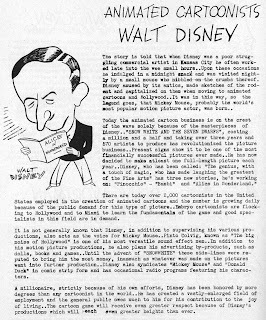 on this blog: the Walt Disney page as requested. Now, I gotta get back to the drawing board again. I have this book on loan from Svenskt Seriearkiv and thought I should share a few pages with you. First out is Billy DeBeck. And a bonus pic from 1916! Who will be next? Disney? Holman? Bushmiller? See any name on the cover that you want me to scan the entry for? Just let me know. 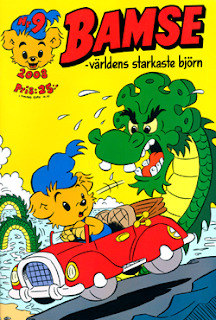 Bamse 9/08 (#465) is out now with a cover by yours truly and Adam Blomgren. For those of you interested in "behind the scenes" stuff here's a step-by-step of the creation of the cover. First I made a rough layout sketch wich I used to pitch my idea to the Editor in Chief, Lisbeth Wremby. 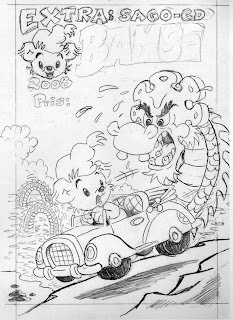 She liked it and I sent it to one of the Bamse artists: Adam Blomgren. He then refined my idea and made a finished pencil drawing out of it. Adam then scanned the drawing and mailed it to me at the office. I then inked it on a Schollerhammer paper, A4 size in 100% of the print size. 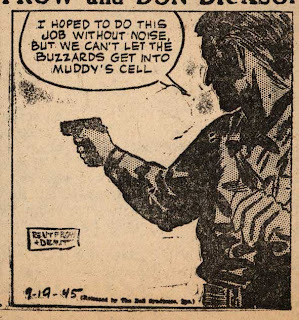 As some of you guessed (or saw) the sample panels I posted two days ago were drawn by Bill Draut (1921-1993). 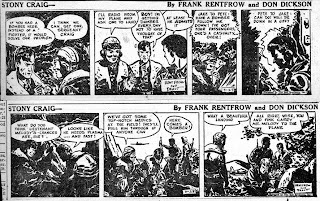 The strip was named Stony Craig and was credited to Frank H Rentfrow and Don Dixon, although all the strips I have from March 1945 to June 1946 are signed by Rentfrow and Draut. Anyone who knows when Draut started doing the artwork? 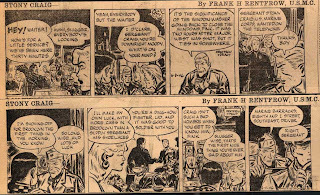 Looking at the early strips in my run you can see a young artist (ca 25) who struggles hard to imitate the style of what must have been his heroes: Caniff, Sickles and Robbins. Not too bad but not that good either. Just like Bert Christman when he took over Scorchy Smith from Noel Sickles. 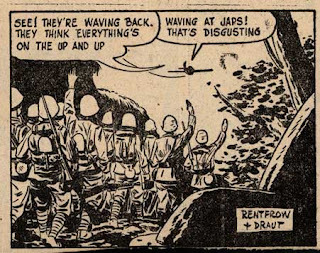 Jump to June 1946 and we see a much more confident Draut with thick and elegant brushstrokes. He don't try to hide as much with black shadows anymore. Hey, even some beautiful profile shots of girls are thrown in to the strip. (These are the only ones I've seen in the whole run.) Who knows how good it would have looked if he had continued yet another year. My sources says that Lin Streeter took over the strip after Draut and that it folded the same year. No surprise to me. Even if the art was interesting the script was really, really bad. 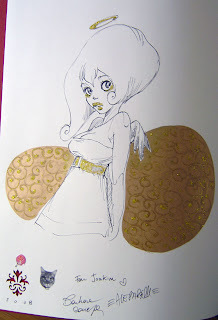 No wonder Draut artwork seemed uninspired at times. 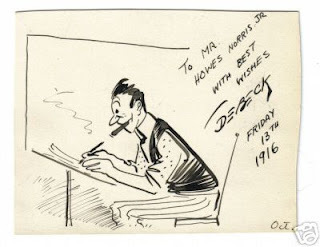 But every now and then there would be a panel or two that would have fit nicely in any Caniff or Robbins daily. Like this one for example. 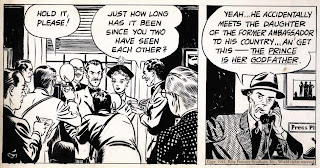 When his last strip appeard he was already working for a coulpe of guys called Joe Simon and Jack Kirby (What ever happened to them...) and their new title Stuntman, were he did "The furnished room". 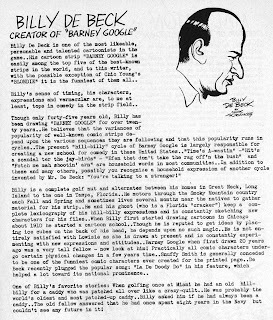 He stayed with comic books and worked for Harvey, Warren, DC and Marvel etc. Stony Craig is one of the many forgotten strips that never made it big time. However, for me my set of Stony Craig dailies is more than just a set of tearsheets. It's a document of a struggling artist taking his first step in a career that he would stay with a long, long time. 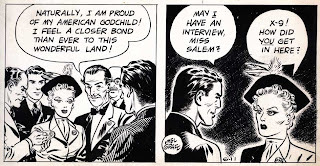 By the years the Caniff/Sickles influence faded away more and more but every now and then you could see bits and pieces of the style he learned in the mid 40's. I hope you enjoyed these samples. Saw this X-mas cover on eBay and just wanted to share it with you. From Sunday mirror December 20, 1936. Art by...? Never seen it before. 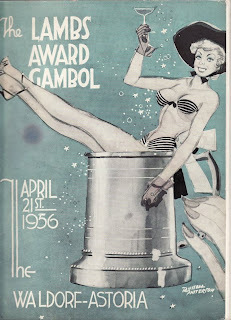 If you are a fan of the Sickles/Caniff school and enjoys artwork by artists like Frank Robbins, Mel Graff and Charles Raab this might be something for you. What is it then? you might ask. Just stay tuned and I'll post more on the subject soon. I'm a Belgian fan of comics. I'd like to contact daan Jippes. Could you help me, or forward my email address to him. 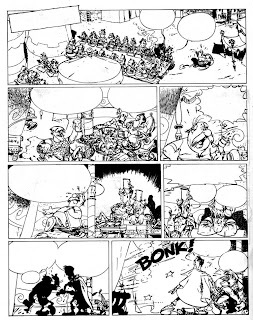 A friend of mine does have an original page of Astérix (unpublished). I'm 90% sure it's Daan's work. I'd like him to confirm. 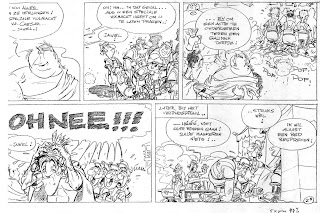 Please, if you can help me ... Dominique"
"[...] happy to oblige re the questions around the "why"of those 2 Asterix pages I drew in the spring of 1981. 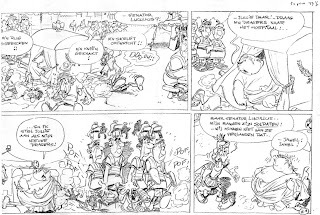 An agency in Amsterdam got wind of Editeurs Albert/Rene`s plans for a monthly Asterix magazine, and contacted me to do the art for a 32 page story, for which Lo Hartog van Banda ( ex- Marten Toonder Studios) had already done a synopsis, plus script for pages 1 to 4. All I know ( because at the time I was living in Van Nuys, California) is that the work was submitted for approval to a guy in Bruxelles, Belgium, and then....zilch; nothing! As we all know that magazine never saw the light. Was my effort ever SEEN by Uderzo? One wonders..."
Dominique: I hope this gives an answer to if the page is one of Jippes or not. Please let us know. Here's some rare cover art by Russell Patterson and interior art by Al Taliaferro. Never seen these before. And while I'm at it why not throw in a Patterson painting from his early days titled "My villa In Normandy" . Just for fun. :) Love the colors on this one. Now, I gotta rush. Got a bus to catch. 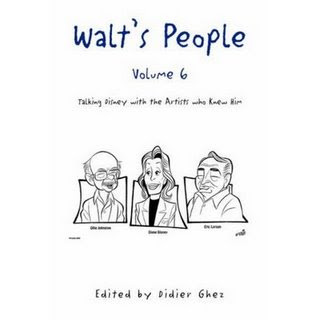 Walt's people vol. 6 is now available on Amazon.com! 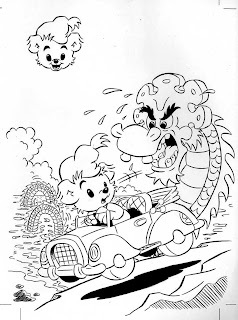 I own the original art to this promotional piece drawn by Floyd Gottfredson in 1968. Anyone who knows where/if this was published? 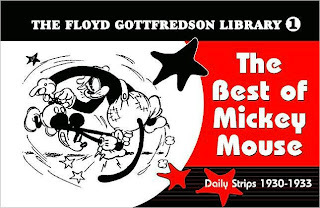 Notice that unlike most of the later Gottfredson art this piece doesn't have yellowed zip-a-tone. Instead only blue indicating where the dot pattern should be added. Also notice that the board has been cut of to the left. (The thin blue line that "frames" the drawing is clearly cut off, indicating something's missing.) Maybe the parade continued with the ducks etc. after Mickeys car? Does that art still exist? Any Disney publisher who wants to use this? Feel free to let me know. 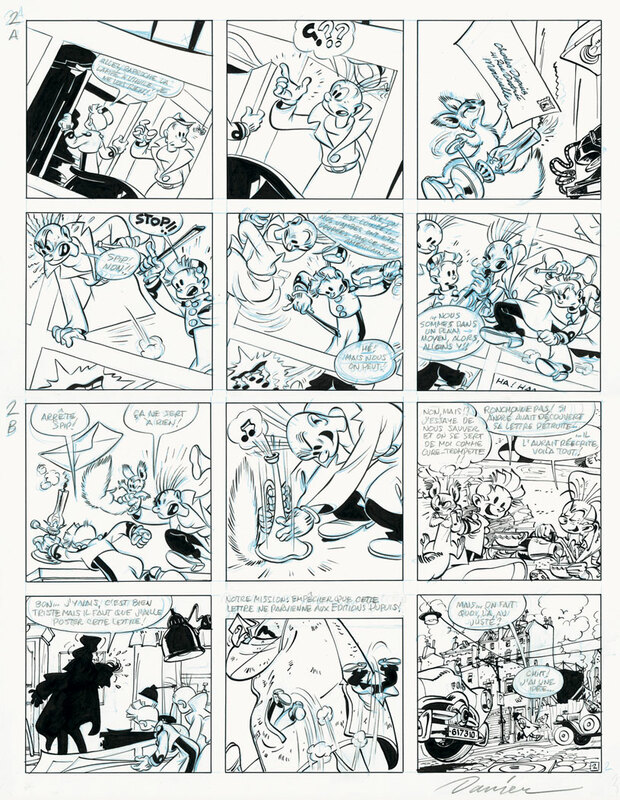 A big thanks to Timo who directed me to these two Spirou pages drawn by Daan Jippes under the name Danier, written by him and Yann and translated into french by Etienne. Daan: This is really wonderful tribute! 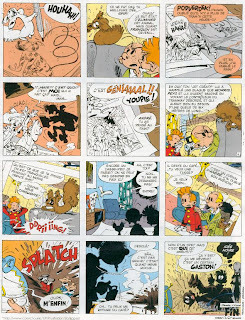 Maybe a longer Spirou story some day ? And don't forget to check out Daans first Havank album. Some samples can be found if you use the Labels function. (Just click on Daans name below.) 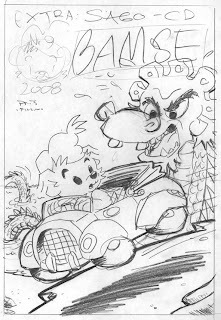 Just did that myself and realized that I had missed one comment from Daan regarding one of his childhood drawings. Page 2, from the Galerie Laqua site. 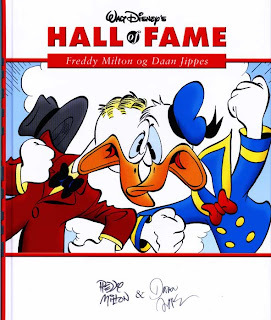 The long awaited Freddy Milton & Daan Jippes volume of "Hall of Fame" has just been released in Denmark. The book has 14 of the 16 stories they made together in the late 70's, early 80's. Too bad the last two is missing as one of them is no doubt one of their best. Rumor has it that the finnish edition will include all of them so why not the danish edition? 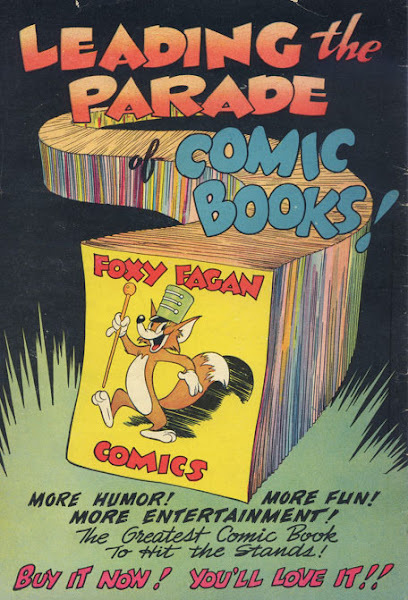 The illustrations in the bonus material is culled from old issues of Carl Barks & Co. so no new archive searches for unpublished material seems to have been done. Too bad, but I guess it's a matter of time. And money. It should be noted that this book won't be released I Sweden. So Fans of Milton and Jippes will need to order this one from Denmark. Because even if it has minor flaws (Like placing Jippes afterword before the stories...) the stories and artwork makes this book one of the really essential HoF volumes. Grest stuff, great stuff! 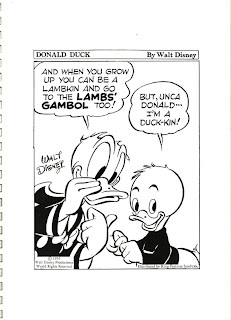 Page 46 states that the cover shown was made for the story "Levertrankonkurrencen" (" Liters lekkere levertraan") but the cover doesn't seem to have anything to do with that story at all, except that both the cover and the story features Donald and Gladstone. Was the cover really made for that story? 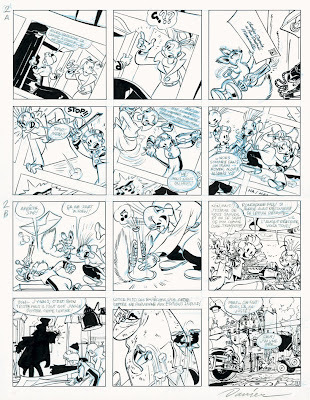 Page 12 has the info that Daan drew Spirou. 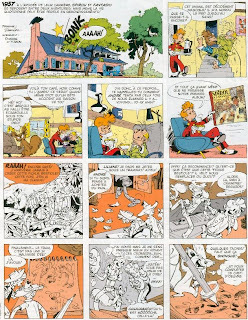 I've seen art he made for Franquins Gaston, but wich Spirou episode did he do? Were does this info come from? 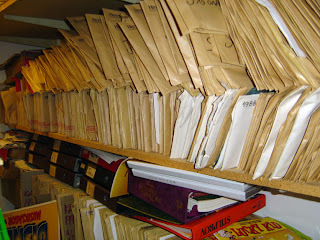 So imagine that you are a Swedish Disney collector and have a complete run of Kalle Anka & C:o issues from 1948 to 2008. But, do you really have everything? I bet you don't, if you count all of the extra stuff that came with the comic books. Now, most of the toys that are sent out today is uninteresting for the collector, but back inte 70's and 80's there were lots of interesting things printed and given away or used as extras in the weekly. 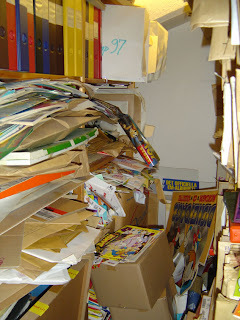 Some of them were given away to participants to the Kalle Anka Cup etc and some were used in the weekly. Betting that none of you out there has all of the stickers shown in this post would be a safe bet. Thats how rare these are. Enjoy! 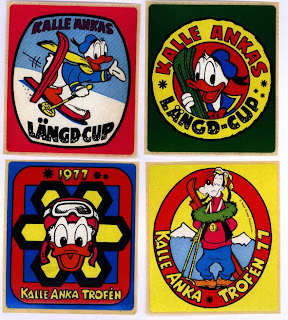 News has reached me that the previous ediotor of the Finnish Aku Ankka (Donald Duck), Markku Kivekäs, has passed away. I only met him once, but judging from that meeting he seemed to be a really good guy. 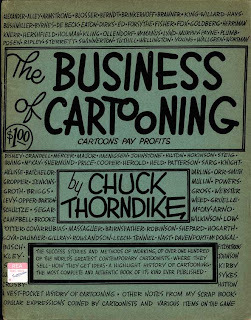 And he handed me his Ex-Libris that Carl Barks had made for him. I just thought I should share it with you. Any opinions on the cover design and the "best of" treatment? 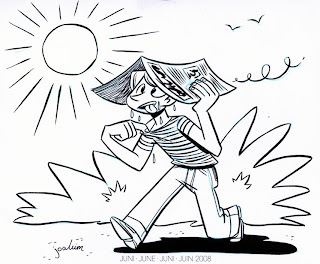 What do you know about the weather in Scandinavia? Back in July 2004 the Swedish Egmont magazines was moving out of the old building at Södra Bulltoftavägen 46 in Malmö. 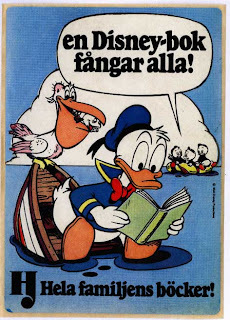 A few years earlier the comic books had moved to new offices, but the Kalle Anka & C:o (Donald Duck & Co.) production archive from the old "Centralateljén" was still there in a storage room on the third floor. Since I work part time at Egmont I usually go home at 12.00 on Fridays. 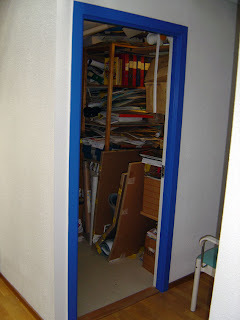 But this particular Friday in July I had stayed until three and was on my way home when someone told me that it had been ordered that the old archive should be thrown in the dumpsters. I grabbed a colleauge and went to the old offices. Luckily they hadn't started to throw it out yet. I made sure it got packed down in boxes instead and thus a piece of Swedish Disney history was rescued. 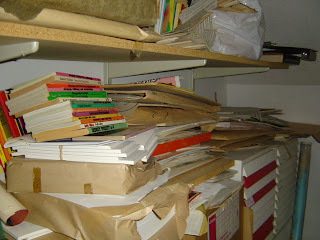 Most of the material ranged from the mid 70's to the mid 90's. Original art and production materials. Comic books and black and white films. Stickers and posters. Invitations to social events and business cards. etc. etc. 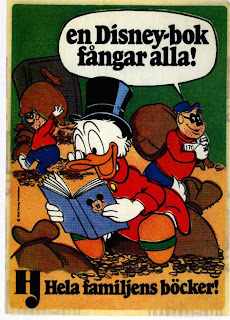 An unique insight to the production of Swedish Disney comics during these 20 years. After a wile I and two colleauges were able to sort through the boxes during a span of a year. Some was junk and was thrown away. 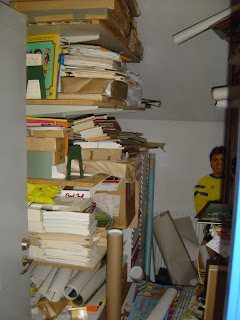 Other stuff like printing films were returned to Copenhagen and a big chunk was donated to Svenskt Seriearkiv. 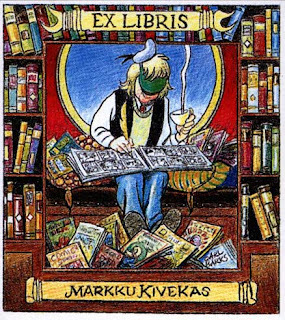 (the Swedish Comics Archive.) So the important stuff survived. This time. I've heard so many "horror stories" about archives beeing thrown away I'm happy that I was able to save this one. If I had went home early as I should that day it would all have been landfill now. 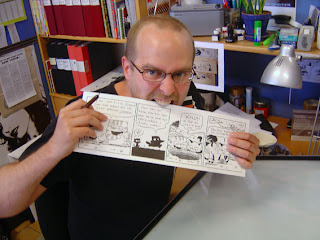 Spent the saturday in Copenhagen at komiks.dk. Lots of artists/writers and fans there. Myself, I made an exception and I waited in line to get a book signed. Used to do that a lot when I was younger. But nowdays I just get tired of waiting in lines. 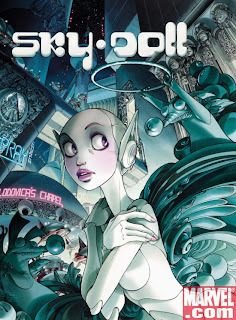 If you don't know who they are you probably havn't heard of Sky Doll either so here are two teasers. These are the covers to album 1 and 3. #1 should be out now in USA and here are several different european editions available. 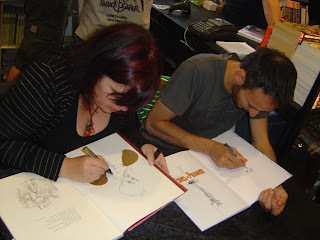 And here thay are, hard at work, doing drawings in the newly released danish editions of Sky Doll. Look for them here in a day or two.